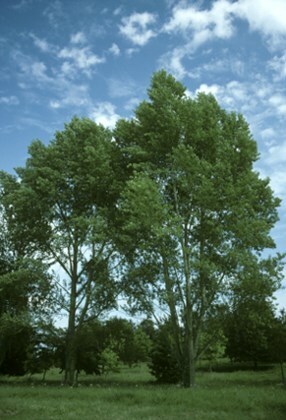 Could you find a home for a black poplar tree (or 2 or 3)? According to the Forestry Commission the black poplar is the most endangered native timber tree in Britain. It has suffered severe declines and it is estimated that only 8,000 now exist in the UK, with only 400 being female. Many of our native black poplars are getting old and without a concerted effort to protect existing trees, to plant saplings and to restore habitats to enable natural reproduction, black poplars could soon become extinct in the UK. Historically black poplar played a significant role in local communities and the wood was often used commercially as the tree is fast growing and has many desirable properties. It can be coppiced or pollarded to provide a crop of wood for bean sticks, thatching spars, scaffolding poles and fruit baskets. Young shoots (which do not split easily) were used in Victorian times as clothes pegs. The wood is relatively fire resistant and was often used for flooring when paraffin lamps were still in use. It is naturally springy and was used to make cart wheels, wagon bottoms and clogs. The branches of mature trees grow in a natural curve such that the timber could be used to make the arched supports of timber framed buildings. Later, it was discovered that the wood absorbed paraffin so it was used to make matches. The Black poplar tree is famously depicted in John Constable’s painting ‘The Hay Wain’. The tree is also valuable for wildlife and has over 100 specialist insects associated with it. Moth species include the hornet moth, wood leopard moth and poplar hawk moth. The catkins provide an early source of pollen and nectar for bees and the seeds are enjoyed by finches. The rare migrant butterflies the large tortoiseshell and the Camberwell beauty rely upon poplar and elm species for their food plants. A decline in both of these tree species has resulted in these butterflies becoming extinct in the UK. If you think you have a place for one or more black poplars please let me know. The truncheons are free and we will help you to plant them or plant them for you. There is no obligation to do anything more.